When I was originally asked about the merits of launching an ethical fund, I was sceptical. The last time I’d heard such enthusiasm for ethical funds was right before the GFC. As I thought more seriously about investing ethically, I did two things. First, I considered what ethical investing actually means. The key point is that it’s not just about avoiding high polluting companies. How many times have we seen disgraceful corporate and individual behaviour go unpunished while shareholders foot the bill? Think cigarette companies, or James Hardie and asbestos claims. The Hayne Inquiry is only the latest attempt to expose unethical behaviour, which seems to grow along with bull markets. John Kenneth Galbraith referred to corporate larceny as ‘the bezzle’ way back in 1955 in his classic book, The Great Crash 1929. Only now, it seems, have we reached a point where we can have an impact calling out bad corporate behaviour. It’s hardly surprising that Hayne singled out National Australia Bank’s top brass when 88% of shareholders voted against the company’s remuneration report last December. Shareholders want action. Listen to Alan Kohler and Nathan Bell chat about ethical investing in the below podcast. You make a fairly convincing case for ethical investing because it’s not only outperformance but lower risk. Let’s start with the outperformance, how much outperformance do you think ethical investing achieves? Yeah, it’s funny, when I was first brought in to discuss an ethical fund or launch an ethical fund, you could’ve coloured me sceptical. The reason is that I feel like the last time I heard all about ethical funds was in 2006/7 when everyone was feeling rich with good returns and I think they just want to feel good about their money but there’s a growing body of evidence now that’s showing it is actually outperforming. The Responsible Investing Association of Australia compared over the last 10 years ethical funds, compared to the average Australian fund and to the market. The average increase in return per annum was 1.4% to 1.9%, so that’s potentially over the average fund, an almost 2% annualised return. That’s just outperformance. Now, the reason you are a little bit sceptical of this is because that’s over the last 10 years, and that’s effectively the huge bull market we’ve seen in the US. The stocks that you see in a lot of ethical funds are the healthcare companies in Australia for example, which are potentially overvalued at the moment, or trading near 35 times earnings. I decided a better way to look at this was actually to go back through the audited recommendations report of Intelligent Investor which has around 500 recommendations dating back to 2004, and low and behold, the average return from the recommendations that were considered ethical was 14.8% compared to 10.1% for those considered unethical. That’s an almost 5% annualised gap. A 4.7% annualised gap. That’s amazing. Over time obviously, that compounds at a massive rate. Absolutely, I always think if we’re doing 1 to 2% over the index over time then we’re doing our job. What the key things responsible for that 4.7%? I think there’s a number of things, but one of them is the two main groups, I think, of the companies that fall into the unethical basket in Australia tend to be the resources companies and companies associated with gambling which is the pokies companies, casinos. Now, they’re actually not too bad a businesses, but the resources companies that make up a large part of our index in Australia, if you think about the nature of those businesses they have to take their profits all the time, and then just reinvest into digging more holes in the ground and it’s just a very hard way to make money. You’ve seen all the headlines of the last 20 years, Alan, BHP all these sorts of companies blowing up capital on shale investments and these sorts of things; the capital allocation has been really poor but the return on equity of these businesses tends to be pretty poor as well and very, very uneven. You can have many bad years. Are we saying that all resources companies are unethical? There’s nothing wrong with gold mining surely? Well, you’re digging holes in the ground, and the way people think about ethical is just that they don’t want that done, and if you see the remediation done on some of these pits it’s pretty ordinary. Ethics can be different things to different people, I suppose. Well, I think this is the grey area, right? I think in 97% of times it’s going to be absolutely black and white but it’s the other 3% of times. Four Corners did an expose last year, on how a CSL collects its blood in America. If you saw that episode there’s no way you’d feel like investing in CSL as an ethical business. Yet if you talk to anyone about putting together an ethical portfolio, I guarantee CSL would be the first stock that they put in there. Well if you didn’t have CSL in there your outperformance would diminish somewhat? Yeah, I think it’s the holy trilogy, ResMed and Cochlear as well. Yes, that’s right. Talk to us about the risks because you’re also saying that the risks of ethical investing are lower, why is that? Yeah, I think there’s been a real change over the last couple of years, and it’s not one thing specifically, but I think if you tie all these things together you can just see the world’s moving in a different direction. If you have a look at Coca-Cola in the US and in Australia, the Coca-Cola companies have really struggled. Consumer preferences are changing, people don’t want to drink unhealthy soft drink anymore, and in some of those countries you see sugar taxes, so that’s one way consumer preferences are actually dictating the market. If you’re unethical in that sense of providing unhealthy goods, you’re actually just finding that you’re getting out-competed by other companies. Some other ones we’ve seen is like NAB had an 88% vote against remuneration for its management recently, again, you see much more shareholder activism against these companies. You add that to the Hayne Inquiry which we’re about to find out today what the impact of that’s going to be, we’ve got aged care now coming under the microscope. You can just see if you look at all these things individually you say, okay, well that’s just industry specific. But if you tie them all together it’s actually just a more social stream of consciousness that’s pushing all in the same direction. What it’s doing if you’re a company that’s considered unethical, you’re having pressure on your profits one way or the other. You’ve seen Woolworths now thinking about getting rid of its pubs simply because it wants to be a business that is considered ethical. Tell us about what your screens are, for you, for your fund, what’s in and what’s out? Yeah, basically, we run a screen, what we call a negative screen, in jargon. That just means we get a big list of the ASX 300 stocks and then we just take out the ones that are easy to take out with a filter. Usually the ones that come out are the energy companies, the resources companies, that’s all your environmental type companies, the gambling companies, the casinos, they tend to be the most obvious ones. Then once we’ve got that list, then we actually look at it ourselves and see whether it makes sense. Because the problem is if you use software to dig out those companies, some of them will be quite complicated. If you take like a Wesfarmers before it split off Coles – well, Coles is a good example. Coles has about 7 or 9% of its revenue and operating profit that comes from liquor and so we’re about just trying to make sure that most of the money that the company earns doesn’t come from unethical sources. Liquor if it was like 100% or 50% or whatever would be out but at less than 10%, Coles is in. This is where we actually have to take our list, and as I said, 97% of companies, it’s black and white and then the other 3% we have to make a judgment. We’ll just be very clear with our investors about what those judgments are. Some people aren’t going to like that. It’s so difficult. A friend of mine always makes the point about Cochlear, which again, everyone loves Cochlear because it’s an ethical business because it’s providing hearing to infants and adults that otherwise wouldn’t have it, but do they really need to earn the profit margins they make and charge $25,000 a pop? If they were a more ethical company, they could make much lower profit. Cochlear is definitely in just to make that clear. But the point is that we’re trying to do it the best we can. It’s normally black and white, but I’m sure there’ll be some concerns that some people will have. Is plastic packaging in or out now? That’s a good question, we’ll sit down with the management team. Amcor is a good example of that, right? And they don’t tend to be great on the ethical score, but it’s not just about environmental as well about the governance of these companies. But everyone’s against plastic packaging now it’s filling up the oceans and going into turtles’ stomachs, I’m just wondering, is that not a blanket out already? It probably should be. The reason I haven’t actually thought about is because the number one thing you got to look at the portfolio is they’ve got to be good companies in the first place. I actually don’t think Amcor’s that great a business so I haven’t actually done a lot of thinking about it. It hasn’t been in our portfolio ever at Intelligent Investor. The problem is, it has that same problem as a lot of the resources companies, it’s just a really capital-intensive business and has to take a lot of profits and reinvest in the business, so in fact, it’s already out on that score. Any other companies you want to mention that are out or in? Not necessarily out or in but the really important point I want to make is that we’re not just going to put a company in the portfolio because it’s ethical. The most important thing is it still needs to tick all the boxes from our process that we’ve had for over 20 years, it’s outperformed the market. The company still needs to be good quality, we still need good management, preferably with management with skin in the game, and we want to pay a decent price of the business. If it doesn’t take all those boxes, then just because it’s ethical the stock’s not going to get into the portfolio. The other interesting thing about this fund is that it’s an active ETF. Describe what is an active ETF? Basically, what this means is you can go onto the stock market and you can buy a ready-made portfolio just like you’re buying any other stock, so you don’t have to go and fill in all the paperwork like you would with any other normal fund that’s unlisted. In terms of the active management, that basically means myself and the team are sitting there in the background, trying to work out every day when we come into the office, what’s the best portfolio for our clients according to our brief, which is ethical stocks that are undervalued. That’s the way we come in and look at the portfolio every day, but will be actively managing those positions on a daily or weekly or monthly basis. Our turnover tends to be very low; we’re long term contrarian investors. But that ‘active’ means that we’ll be trying to have the best portfolio every day. But it’s an ETF, which means presumably, there’s never a premium or discount to NTA. No, that’s right, we’ve got a process in the background to always make sure you don’t have to pay a premium to get into the fund like an LIC, for example. Yeah, that’s right. That’s the difference between an ETF and an LIC, of course, is that an LIC can sometimes trade at a premium or discount. That’s right. Unfortunately, you won’t get a chance to buy it at a discount but at least you’ll be paying a fair price and you don’t have to fill in any paperwork. Yeah, great to talk to you, Nathan, thank you. It makes sense that ethical companies should have better survival rates and produce higher returns over long periods, as they meet the standards expected of all stakeholders, from staff to shareholders and everyone in between. It’s hard to be loyal to a company that you don’t respect, whether you’re a customer or staff member. Companies that don’t meet these expectations should wither and die in a capitalist economy, assuming there are suitable alternatives and switching costs are relatively low. For example, Elon Musk and Tesla are upending the auto-industry in the biggest change it has faced since Henry Ford introduced the Model T, as countries led by Europe try to reduce pollution. If you’re a long-term investor in an increasingly technological world of lower prices and returns, it makes sense to seek the admirable companies out. There’s enough risk to businesses without adding ethical concerns. The second thing I wanted to know was whether investing in ethical companies would reduce returns. 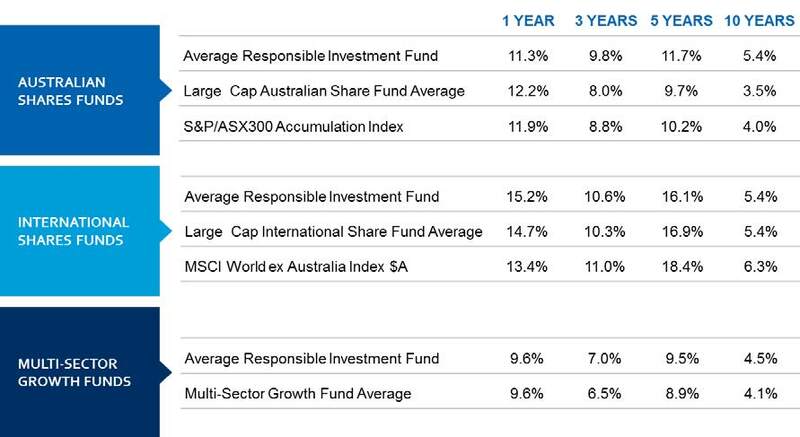 According to the Responsible Investment Association of Australia (RIAA), over the past 10 years responsible funds have on average beaten large cap Australian funds by 1.9% per year and the ASX300 by 1.4% per year. Unfortunately, this evidence has only been tested over the past decade, encompassing the longest US bull market in history. It would be much more reliable if the data was tested through several market and business cycles. I decided to test the audited Buy recommendations of our online research provider Intelligent Investor, where I worked for nearly ten years. The last audited report was done as at 30 June 2018 including 408 recommendations stretching back to June 2001. The 346 ‘ethical’ recommendations produced an average annual return of 14.8%, materially ahead of the 10.1% produced by the 62 recommendations considered unethical. Our experience also suggests investing ethically pays off. Unethical companies that were successful recommendations included casino operators such as Star Entertainment and Crown, pokie manufacturer Aristocrat, and gambling and lottery operators Tatts and Tabcorp. Pub manager ALE Property Group was also considered unethical due to liquor sales and pokies. While we had successful calls in the resources space, including BHP, South 32, and Woodside Petroleum amongst others, it was also the source of some major losses. In contrast to what I expected, based on our history, restricting stock selection to ethical companies should improve our returns. Furthermore, with companies like Woolworths considering selling its pubs to more closely comply with ethical standards, for example, the investable universe of stocks could increase over time. That blue-chip staples like Woolworths are thinking this way shows that ethical investing is not a fad, but rather is becoming a normal part of company analysis. When ethical considerations form part of CEO remuneration you’re guaranteed to see change. Whether it’s governments clamping down on industries, such as sugar taxes on soft drink companies (once thought of as some of the best businesses in the world), or competitors with new offerings (think renewables replacing fossil fuels), either the market or government is going to shrink your profits if you’re not ethical. But just because a business is considered ethical doesn’t mean you should buy it. The reason our investors and subscribers have stuck with us for 20 years is because we think long-term and focus on value and quality. There’s no point buying an ethical business if it’s overvalued or its future cashflows are at high risk for fundamental reasons, such as increasing competition. Our pragmatic approach has served clients well for nearly twenty years, and we expect that to continue. An ethical approach goes hand in hand with our value philosophy, which is why we’re looking to launch an ethical fund to complement our Growth Fund, Income Fund and Small Companies Fund. If you would like more information on our upcoming Ethical Fund, click here. Be sure to register your interest for further updates.